A creative play on the word that means, “a typical example or pattern of something,” Rob Pero shattered his existing pattern and created Perodigm Design Studio. For the past six years, Rob has embraced the right side of his brain and the creativity and free-thinking that comes with it. Having left a successful career in insurance where it would have been easy to become complacent and settle into a routine, Rob realized that his success had to be tied to something more than just financial security. His success had to combine something he was passionate about and something that would allow him to reconnect with his Native routes. Starting over can be a scary proposition especially when you combine a home office with a growing family. So, Rob began searching for like-minded individuals and businesses to network with. That’s when he met Craig, Gary, and Bev at the AICCW-FACC. “Joining the Chamber was instrumental in the growth of Perodigm. The networking, training, and credit counseling helped me understand the big picture and allowed me to start working on my business instead of in my business” stated Rob. Armed with a solid plan, growing network, and vision for the future, Rob looked to secure capital to expand Perodigm into a full-service digital media agency. Rob shared, “the team at First American Capital Credit provided so much more than capital. They shared the vision of Perodigm and helped me network with an ever-growing list of Native-owned businesses.” Not one to sit on his hands, Rob immediately put his small business loan to work opening a new office in Cambridge, WI, purchasing cutting-edge equipment and expanding his service offering. All this combined and Perodigm was nominated for the Small Business Excellence Award at the 2017 Marketplace. 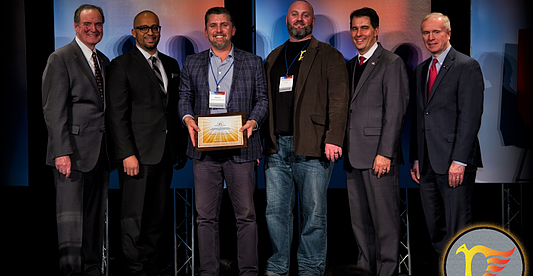 The nomination provided proof-of-concept for Rob and solidified his position in the digital marketing landscape of Wisconsin. “My relationship with the AICCW-FACC was instrumental in opening doors and ultimately being one of three finalists for the award. Winning would have been the icing on the cake but just being nominated, attending the Marketplace event, and surrounding myself with like-minded business owners is a huge win for Perodigm” concluded Rob.